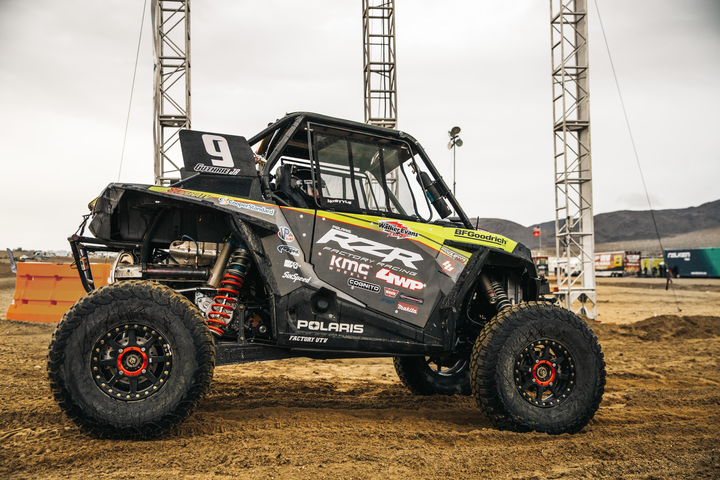 4 Wheel Parts’ Mitch Guthrie Jr. wins the 2019 Can-Am UTV King of the Hammers presented by HCR in a grueling contest where only 28 of 93 entrants finished. 4WP’s Craig Scanlon and Keith Redstrom finished in 15th place, while 4WP drivers Sara Price and Mitch Guthrie Sr. notched Top Ten qualifying runs. The Guthrie father-and-son team has now won eight of the past 11 KOH-UTV titles. Compton, CA (February 5, 2019) – Last weekend, the UTV King of the Hammers podium was once again topped by a champion named Guthrie. Mitch Guthrie Jr., son of KOH legend Mitch Guthrie Sr., set the fastest qualifying time on Saturday. He then took command of the 160-mile race on Sunday, finishing in 4:52:33 and beating second- and third- place drivers Wayland Campbell and Branden Sims by a dominant 27 minutes. 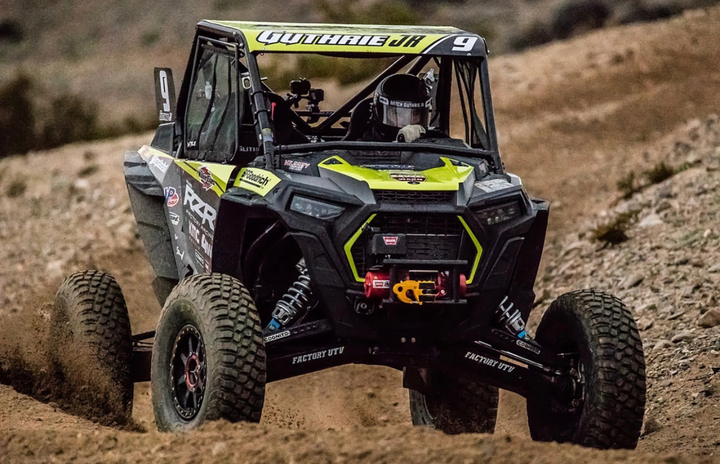 The race was won in the perilous rock-crawling sections as Guthrie Jr. took full advantage of his experience in the Johnson Valley environment, where he practically grew up watching and assisting Guthrie Sr. capture six KOH-UTV titles. The 91-mile loop started off as a speed duel through the desert with Phil Burton and Kyle Chaney but changed demeanor quickly as it moved into treacherous rock sections like Outer Limits and Spooners. As first-time members of the 4 Wheel Parts (4WP) UTV racing team, Guthrie Jr. and Guthrie Sr. piloted and debuted the all-new 2019 Polaris RZR Turbo-S Velocity Series, which were equipped with basic safety features required by the sanctioning body, including a roll cage, racing seats, belts, full doors and window nets. Both RZRs featured stock powertrains to prove the platform’s durability in real-race conditions. 4WP President Craig Scanlon and long-time co-driver Keith Redstrom entered the race for the first time and switched seats to have some fun. They faced challenges but ran consistently all day to finish in 15th place overall. Guthrie Sr. could shift his focus to rooting for his son, Guthrie Jr. Sweepstakes where one lucky customer will receive a brand new 2019 Polaris side-by-side UTV. The winner will have his or her choice of a 2-seat 2019 Polaris RZR XP® 1000, a 3-seat 2019 Polaris RANGER XP® 1000 or 2-seat 2019 Polaris GENERAL® 1000. No purchase is necessary. More details can be found at 4 WHEEL PARTS ANNOUNCES NATIONWIDE SWEEPSTAKES FOR 2019 POLARIS SXS UTV.